I really shouldn't be allowed to have a credit card. I say that because if I weren't in possession of a credit card, I wouldn't be able to buy any of the games and systems that, like so many shiny objects, catch my attention (seemingly out of the blue), blossom into full-blown obsessions and then quickly dissipate as soon as another compelling game or system comes into view. The last such "shiny object" to grab my eye, you may remember, was the WonderSwan. Although I'm still keen on picking up one of these Bandai-made handhelds (especially since I've already bought a few WonderSwan games--more on that soon), I'd be lying if I said I was as interested in it as I was when I wrote this post. 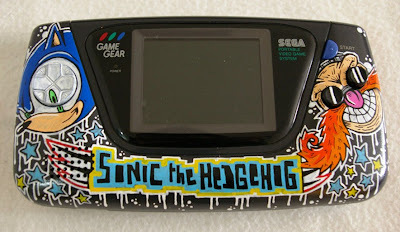 As for what prompted my interest in this peculiar, Japan-only portable to wane a bit (just a bit): Sega's Game Gear. I'm not entirely sure why I've currently got Game Gear on the brain, but I have a feeling it can be blamed on this recent review over at Red Parsley and this one over at VG Junk. Said system was created by none other than the artist who calls himself OSKUNK, of course. I think my favorite part of this OSKUNK creation is how the reflections on Dr. Robotnick's (or Dr. Eggman's, if that's how you roll) sunglass lenses double as labels for the portable's I and II buttons. As much as I love this expertly customized piece of tech, I'd chuck it to the curb like a piece of stale bread if OSKUNK offered up a Game Gear with Pengo characters painted on it. And that system would be tossed out in favor of one branded with characters from the coolest GG title ever created (according to moi): Magical Puzzle Popils. Anyway, should you want to see more of OSKUNK's work (and why wouldn't you? ), feel free to head over to his blog, Custom Art, or his Flickr photostream at your earliest convenience. That is gorgeous! Checked out his site and it's crazy to watch him work! Anyhow, I was a huge Pengo fan way back when it came out in the arcades. Is there something special about the Game Gear version? Wikipedia says there's a Mega Drive sequel and a 3D remake, so I know what I'll be doing tonight. Hmmm, I both agree and disagree with you, warp. I mean, yes, there's definitely a late-90s quality to this particular paint job, but I wouldn't call that a bad thing -- esp. since we're talking about a late-90s game and system. Also, I prefer to think of the style used here as being more like graffiti. As for the GG version of Pengo: No, as far as I'm aware there's nothing special about it. It looks very much like the arcade version, just smaller. That's enough for me, though :) I've never played the MD sequel, by the way, although I really should give it a try sometime soon. Some of his other stuff is good, but for Sonic I guess I'd just prefer a 16-bit Genesis pixel art style -- but maybe that's just too obvious (especially when painting onto a system that's already so heavily pixelized). Oh, that would be nice, too, but I personally prefer this particular style. Like you said, I think a 16-bit pixel style may be a bit too obvious. Ha! Thanks, Gary :) BTW, I just read your review of Fez. I've passed on the game so far, but I think I'm going to pick it up soon -- thanks in large part to your glowing review! I really like the touch of robotnik's glasses. How many memories! I remember when my father bought us the Game Gear! Our first console! Oh, that's a great story, Marco! Which games did you eventually get for the GG -- and which ones were your favorite? I honestly can't wait to get a GG soon. It'll be my first one! I was a total GameBoy fan as a kid, although one of my best friends had a GG and I loved playing it whenever I was at his house.